Fashion Research Institute’s CEO Shenlei Winkler spoke yesterday at the fall meeting of the American Apparel and Footwear Association’s Information System Committee about the use of avatars in the apparel industry. Some of the things we touched on were what an avatar actually is, which for the purposes of our talk is any digital representation or a persona of a physical world person. This includes everything from static 2-dimensional images to fully 3D models. We discussed how the industry is currently using avatars, as ‘talking heads’ on web sites for e-commerce or customer service purposes. We also talked about the use of static 3-D models for purposes of showcasing apparel, also used on retail web sites. We covered the use of avatars for product design in an offline, non-collaborative setting as well as the use of avatars for fitting, size standardization, nonstandard and plus-sized apparel, and even weight loss. Then we discussed the coming evolution with our new service Virtual Runway™, with the use of fully 3-D, AI-enabled avatar models to showcase designs and to quickly iterate upon design concepts with a geographically dispersed audience in a collaborative, immersive environment. We also discussed the use of the patent-pending Black Dress Design Studio for virtual world-based product design and development, allowing granular business information data collection for executive use. 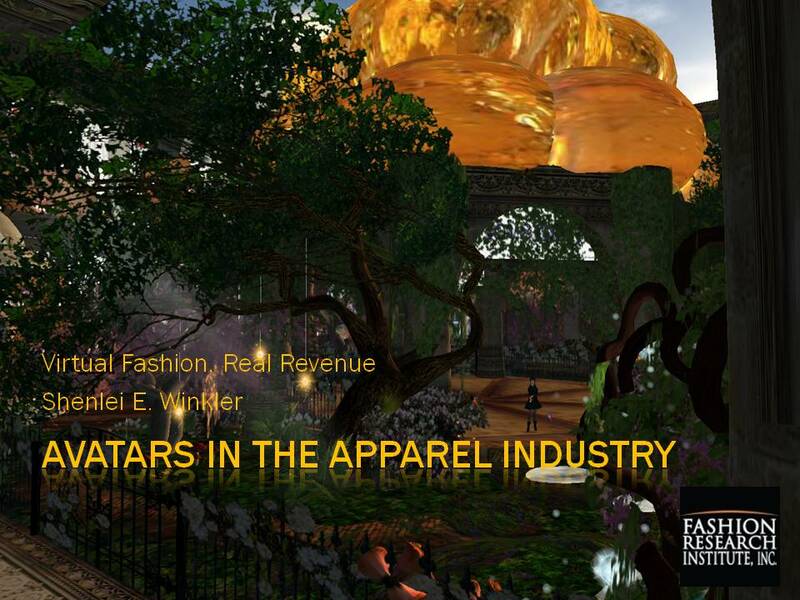 Finally, we closed with some coming previews of the future of avatars in the apparel industry, for marketing, sales, and for product design and development. The talk was well-received and elicited commentary about the future of teh industry. The very first thing that our visitors to our corporate OpenSim islands want to do is customize their avatar, if for no other reason than to get rid of default Ruth. That can turn out to burn the clock, which is costly when we are actually trying to get substantive work accomplished. To help reduce the delay, we have created a pair of new default avatars, Jane and John. Jane and John are both corporate avatars, with a gravitas appropriate to the work we are doing in our OpenSim islands. Jane is a 40-something exec in a jacket and dress with very nice heels and an updo; John is a 40-something exec in a suit with prim captoe shoes and a corporate hair cut. Both are appropriately dressed for a business meeting, and if visitors to Shengri La OpenSim feel a need to further embellish, they can find a range of corporate clothing and a change of hair styles already in their inventory. The Fashion Research Institute is pleased to present a new avatar makeover kit for men in the Shengri La Welcome Area. 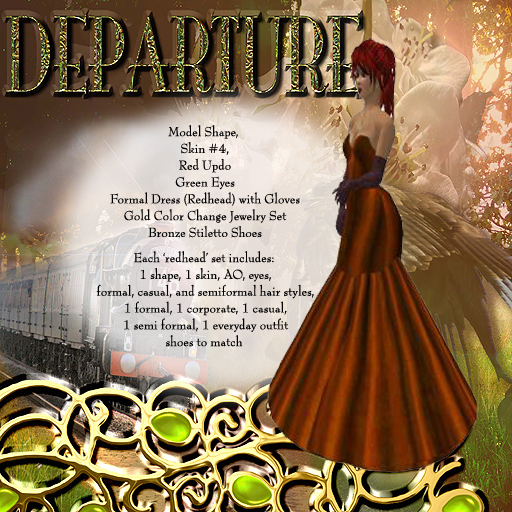 The kit contains shapes, skins, eyes, hair, an male avatar overrider, casual, formal and corporate clothing, shoes and boots and watches in silver and gold. The makeover kit is provided free – buy the kit for $0L. Contents do not transfer. Three hair styles in six shades and three skin tones are included in the kit, and some components are boxed. The full line of women’s makeover kits are also available in the Shengri La Welcome Area. Visit Shengri La to move past your new resident look. Ruth to Ruthless™, only in Shengri La. Collaborators (and others) take note: the Fashion Research Institute has made available new resident avatar kits in the welcome area of our corporate sim complex in Second Life tm Shengri La. 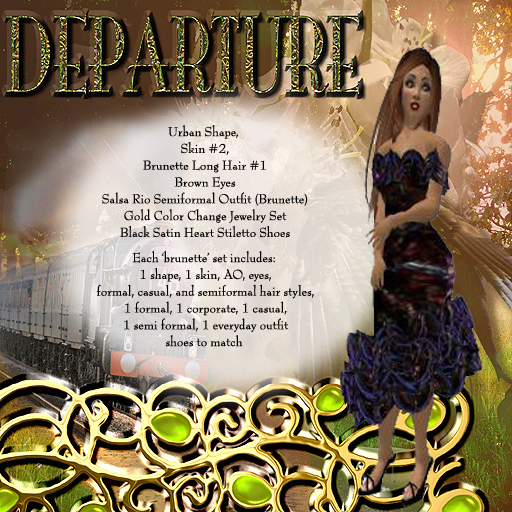 The Departure Ruth to Ruthless kits are currently only available for femme avatars, and include hair, a choice of shapes, a choice of skins, jewelry, shoes, and several outfits as well as a basic avatar overrider set. Choice from five skins; five shapes; four hair colors. 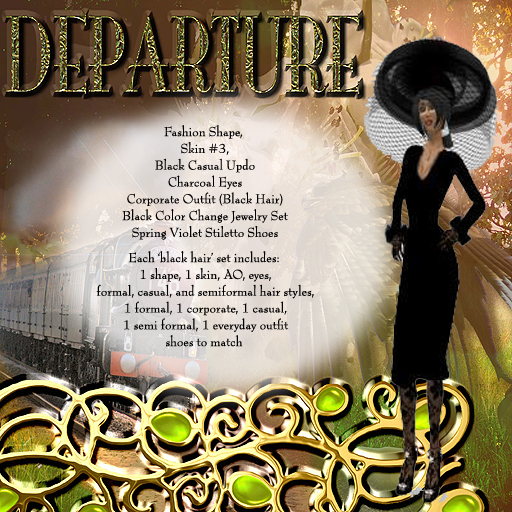 Included is jewelry, several outfits per set, matching shoes, and various and sundry accessories. Each makeover kit is available for a mere $0L. Yes, free. Men’s kits to follow. Women’s avatar makeover kits available by following this SLurl. While you’re there, make sure you check out our resident (and visiting) artists’ exhibits.